Hello Ladies, How you doing? I hope everyone must be enjoying the summers in spite of the hot weather. I love summers as it is the season of dresses, pastels, brights, braids, buns and shorts 😛 altogether so many reasons to love summers. Very soon I’ll be doing a post on summer hair styles.. so stay tuned. 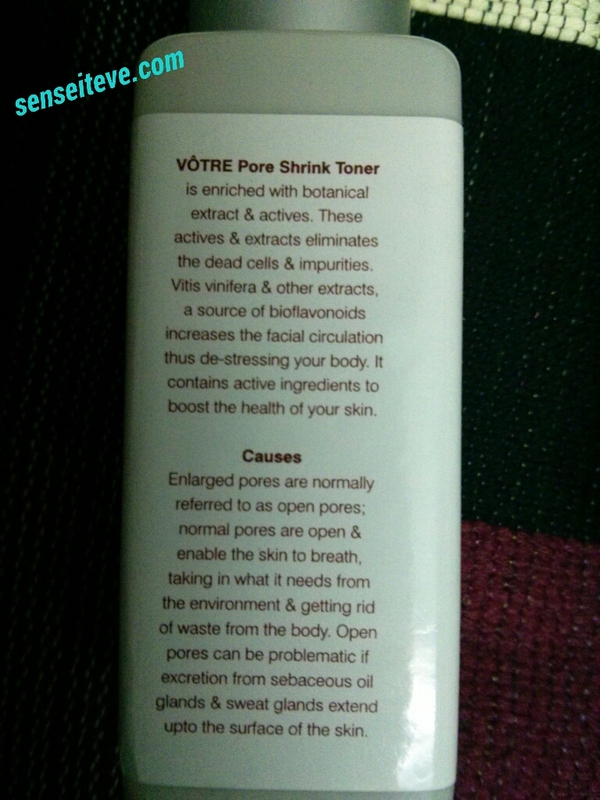 Coming to the product which I’m going to review today “Votre Pore Shrink Toner Hydra Mist”, It’s a product I’ve received as a sample(50ml) product in my jan fabbag , Since then I’ve using it on and off but I’ve continuously used it for a month and I’m ready to share my views on it. 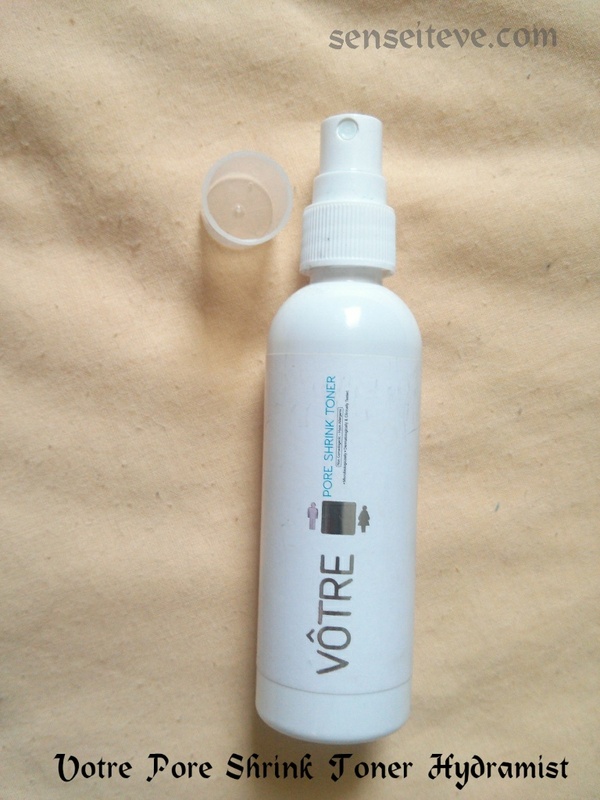 Make your skin flawless with this healthy Pore Shrink Toner from Votre. This one de-stresses the body and boosts the health of your skin. Enriched with botanical extracts along with bio-flavonoids, this one is truly worth its value! 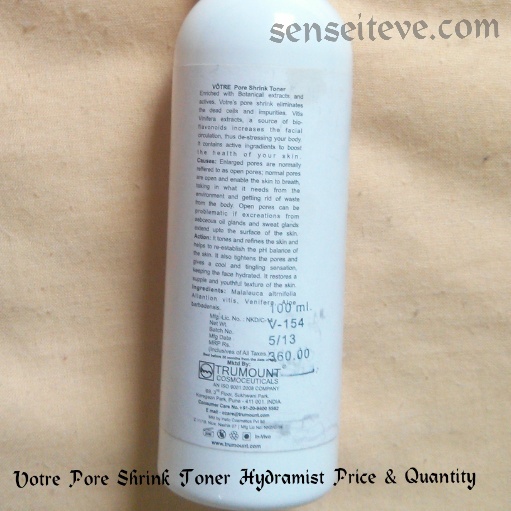 This one of kind toner has increases the facial circulation. Works as an excellent anti Pollutant. Contains active ingredients to boost the health of your skin and also leads to shrinking the pores. Clinically tested, Dermatological approved & 100% effective & safe. This Bio-Cosmetic is 100% botanical, vegan & cruelty free products. 360/- INR for 100ml with 30 months shelf life. Packaging: Product comes only in 100 ml variant. I have 50ml variant which is not available for selling purpose I guess, I have received it in my jan fabbag. 100ml variant comes in a white sturdy bottle with the pump and transparent cap, not sure if it is travel friendly as I don’t have this bottle. 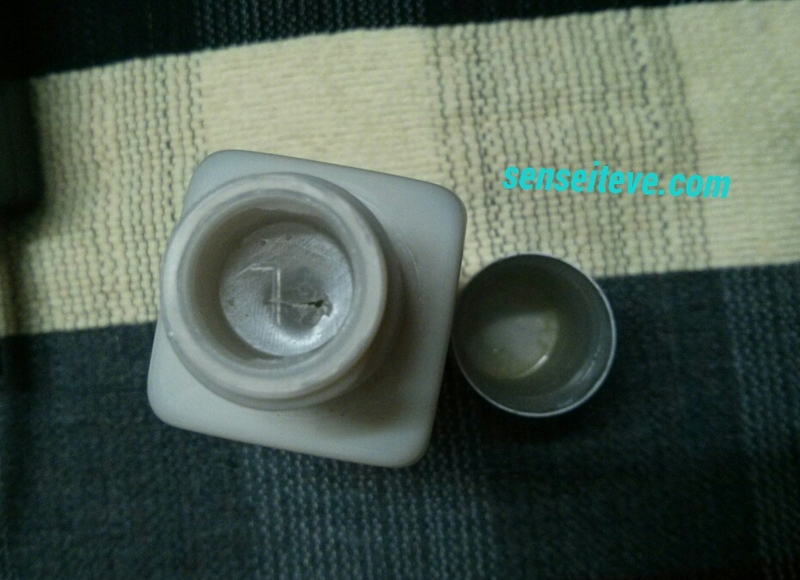 I have sample bottle with me which is rectangular bottle with white sturdy cap which is travel friendly(I will keep this bottle so that I can use it to refill my toner in it when I travel). 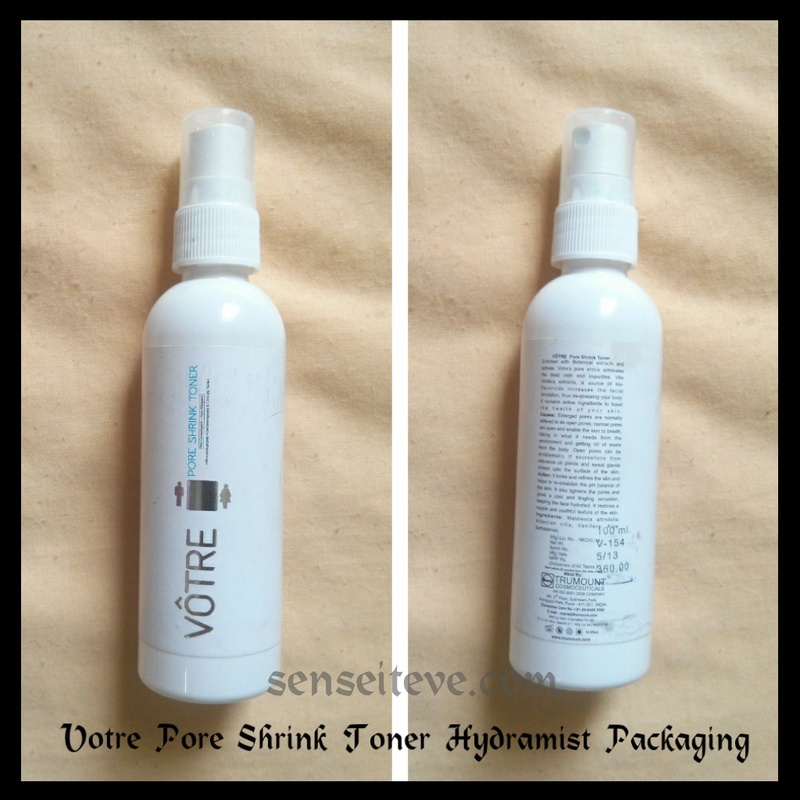 Product: Votre is comparatively lesser known brand in pharmacy and skin care. When I got this product Sample in my January Fabbag, I’ve immediately searched on the internet for reviews, there were not many and the reviews had mixed opinions but still I decided to give it try trusting fabbag team’s judgment on this Pore Shrink Toner. With the sample fabbag also provided a small card having product details and how-to-use instructions. 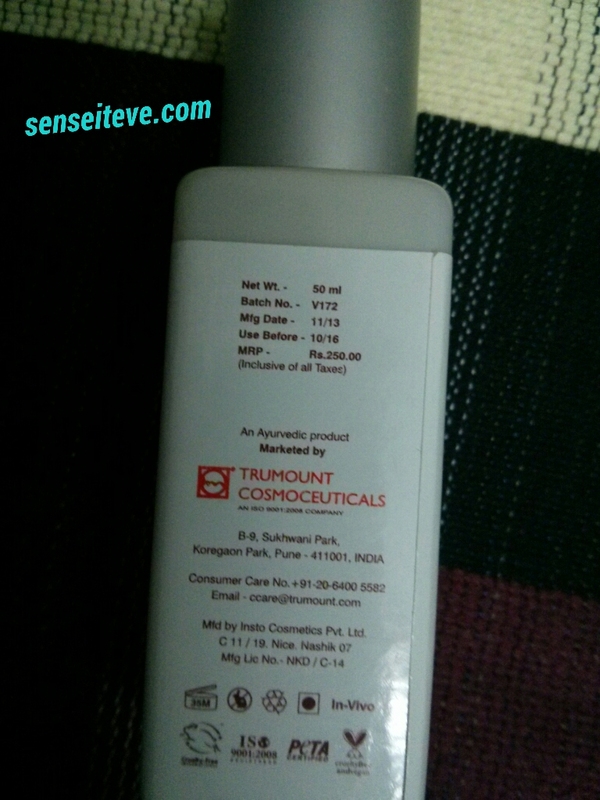 I have used this product with cotton pad and wiped my face-wash cleaned and towel dried face with it. I immediately like the refreshing cooling treatment it gave to my skin and I could feel that my skin loved the sensation. 🙂 It did not sting at all 🙂 My pores looked smaller also(may be due to my over excitement) but after 2-3 hrs my pores looked normal. But after using it continuously for a month my pore size has actually started looking smaller so I’m glad that their “Pore shrinking” claim is true with regular use. And my skin looks healthier and smoother with continuous use of this product. One more thing I want to share that whenever I have a painful abd about-to-pop pimple, I use a piece of cotton pad dipped in this toner and keep it on pimple(I do that with rose water also)…sounds strange!! But trust me the cooling therapy u get on pimple actually calms it down and sometimes I sleep with the wet cotton piece on pimple and in morning….tadaaa pimple gone 🙂 I’m not saying it takes away pimples but yeah it reduces the occurrence. Quickly gets absorbed in skin. Makes skin healthy and glowing. 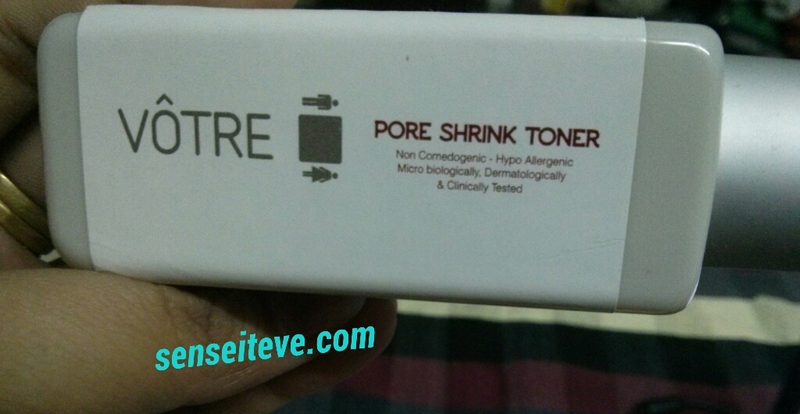 Reduces pore size with regular use. Doesn’t feel sticky or leave any residue on skin. Yeah totally. 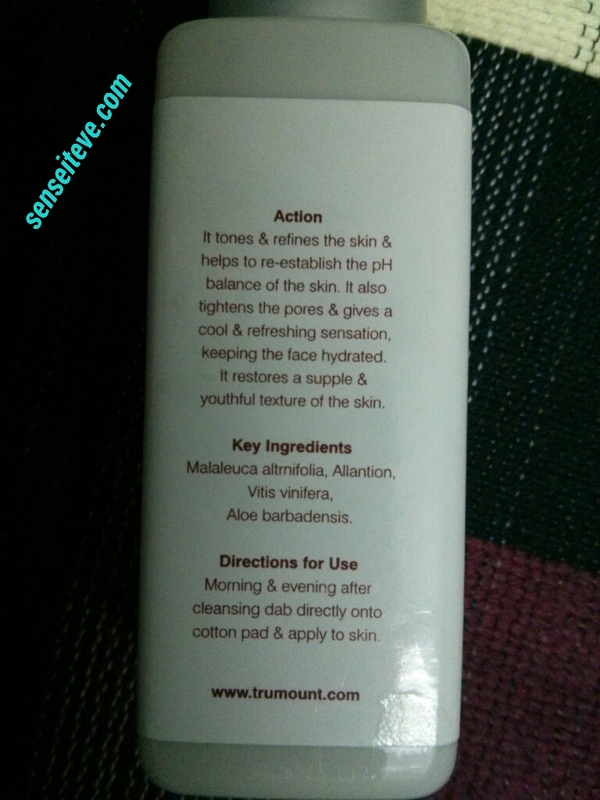 It’s an alcohol free toner and has a cooling refreshing property in it. So I totally recommend it. Go give it a try, your skin is gonna love it in this summer heat. It actually minimized the pores and hence less oil on face. Loved this property of it. It has a nice fragrance .Loving the fact that is vegan and cruelty free. That’s always something I always look for whenever I’m purchasing a new product….